Halloween is such a fun time of year, and we have been busy playing several Halloween-inspired games, many of which are old favorites given a Halloween twist. 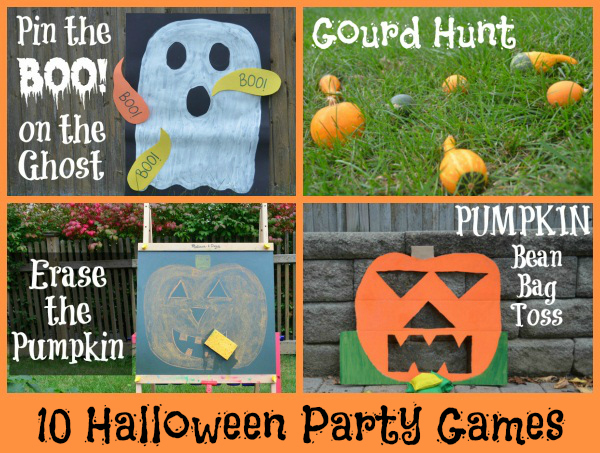 Try these games, and also be sure to grab our free Halloween I Spy game here! 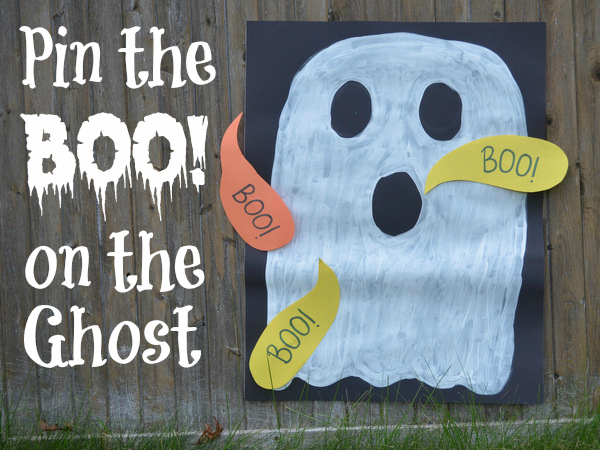 Paint a ghost onto posterboard, and cut out a construction paper “Boo!” for each child. Place rolled tape on the back of each Boo, and have the children take turns trying to pin (or tape) the Boo onto the ghost. The child whose turn it is is blindfolded. For extra fun, instead of a blindfold, use a large witch hat to cover the child’s eyes. Give the traditional 3-legged race a Halloween twist by making it a 3-legged monster race. During the race, challenge the kids to make monster sounds. 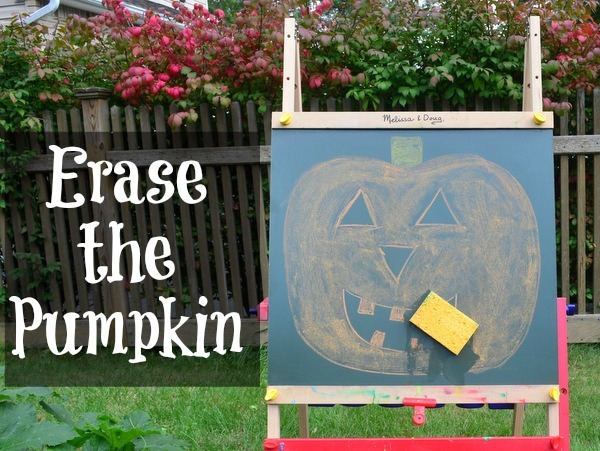 We bring the chalkboard outside, with a drawing of a pumpkin on the board. We hand the kids a damp sponge and they keep throwing until the pumpkin is erased. We also play this inside, over a drop cloth, and with a sponge that an adult wrings out before the kids start throwing. 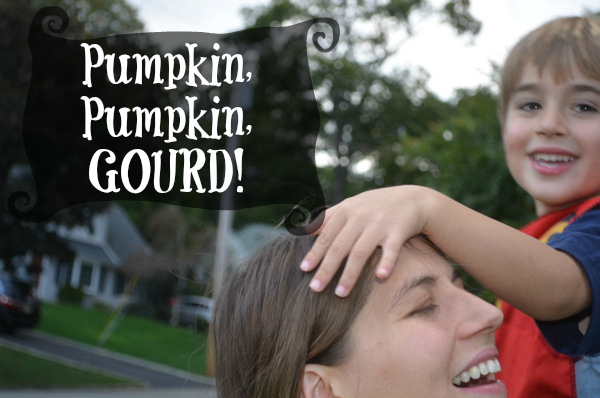 We buy several gourds per child, and have a big gourd hunt. We give each child a paper bag, and they face the fence and close their eyes while we quickly scatter gourds throughout the yard. 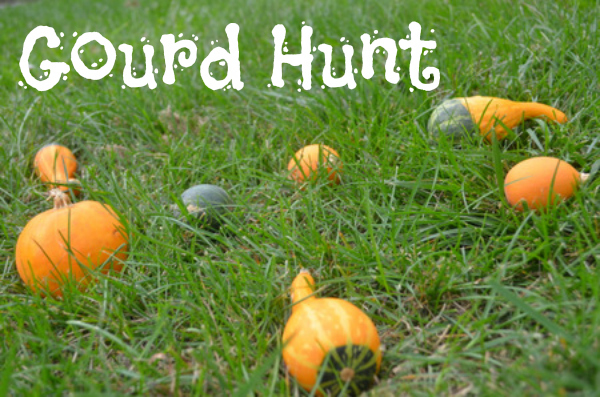 Then the kids turn around and hunt for the gourds. Using black construction paper, I tape a jack-o’-lantern face onto a basketball. I decorate a child’s basketball hoop with orange and black crepe streamers around the rim. Then the kids line up, and take turns seeing how many baskets they can make while I count to 10. 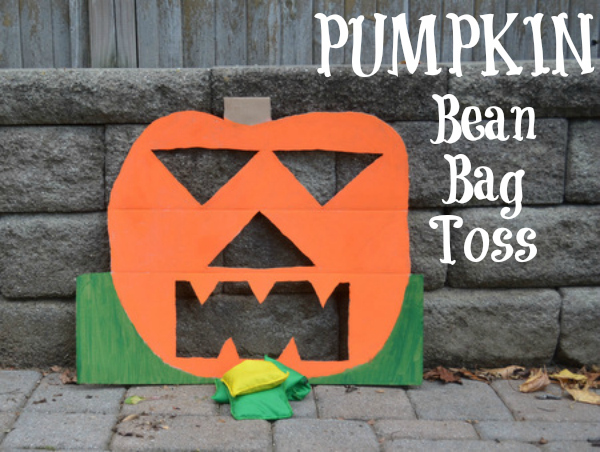 Take a box, and using a sharpie, cut out a pumpkin shape with a jack-o’-lantern face. As you can see, in my cutout, I kept the base flat, and painted it to look as though the pumpkin was sitting on grass. This is so made the pumpkin sit on grass, so that it would be a bit sturdier. When you are cutting, keep the bean bags handy, so you can make sure the holes are wide enough that they will easily fit through. I give each child orange and black streamers, and we dance to Halloween music while waving the streamers around. When I pause the music, everyone freezes until the music starts playing again. This game is sure to lead to lots of giggles! If you are having a costume party, this is practically required! It is so adorable to see all the children proudly march, showing off their costumes. We also like to add a Halloween theme to the parade, asking children to stomp like monsters, stir cauldrons like witches, and other similar movements. 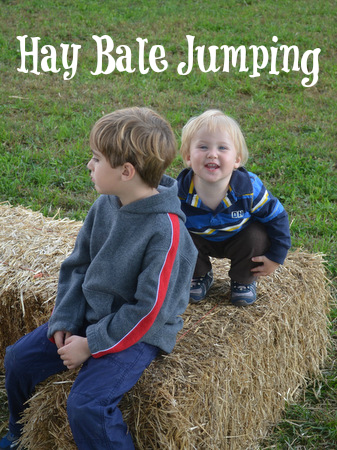 Last year we bought a few hay bales, and let the kids climb all over the hay bales. It was one of the most popular activities at the party. It required no special prep, and the kids really enjoyed it. What other games would you add to a Halloween party?